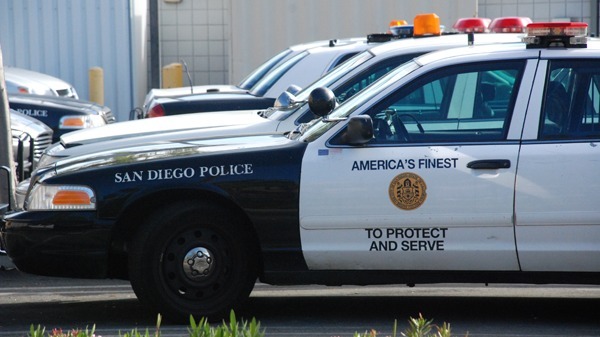 A San Diego Police cruiser. Photo by Chris Stone. A thief pulled a pistol on a clerk at a Fashion Valley watch shop this afternoon and stole a handful of high-end timepieces. The bandit, who appeared to be in his 30s, pretended to shop at the Tourneau store in the 7000 block of Friars Road for a time before confronting the employee, displaying the handgun and demanding merchandise about 3 p.m., according to San Diego police. The robber was described as a thin, roughly 6-foot-2-inch black man. He was wearing a gray button-up shirt, a fedora and white-framed sunglasses, Sgt. Ray Battrick said.